Coventry are the most dominant side overall – and by quite a distance – taking just under 14 shots per match and allowing just over half as many in return. 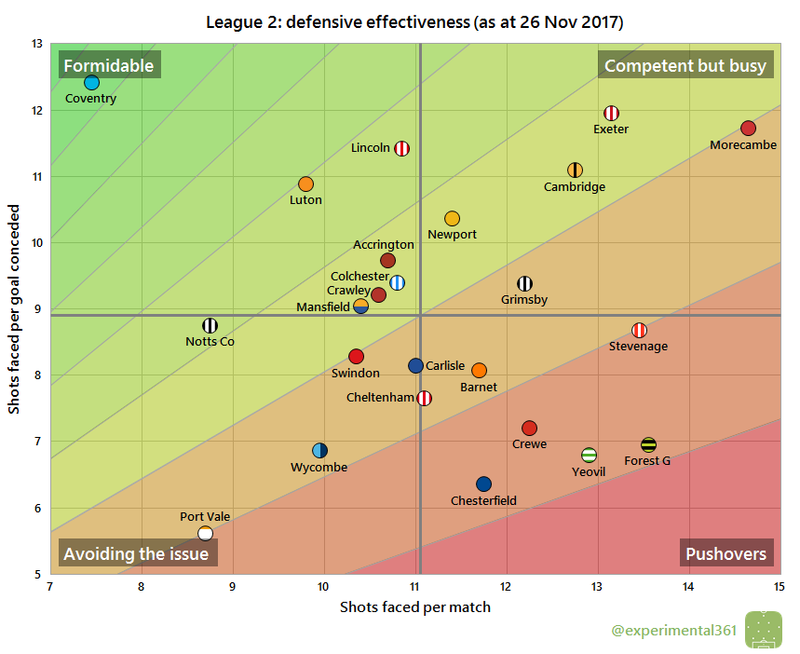 A cluster of teams can match their attacking output – with Wycombe narrowly out-shooting them – but none of these can touch them defensively. 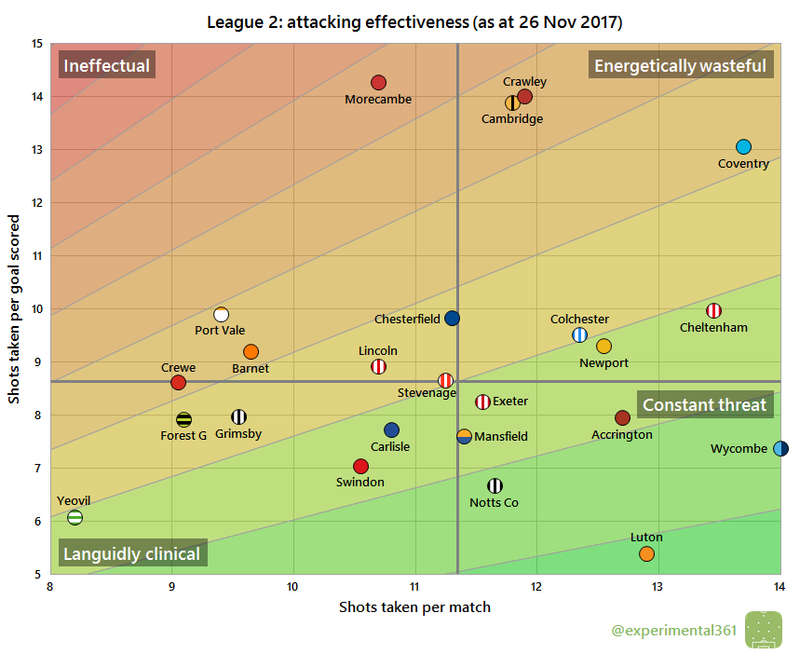 Bottom side Chesterfield haven’t exactly been steamrollered this season: they look to be creating almost as many chances as they’ve allowed, which suggests that they’re capable of avoiding the drop. There’s not much to get excited about at Port Vale matches this season: they allow impressively few chances but don’t create much themselves. 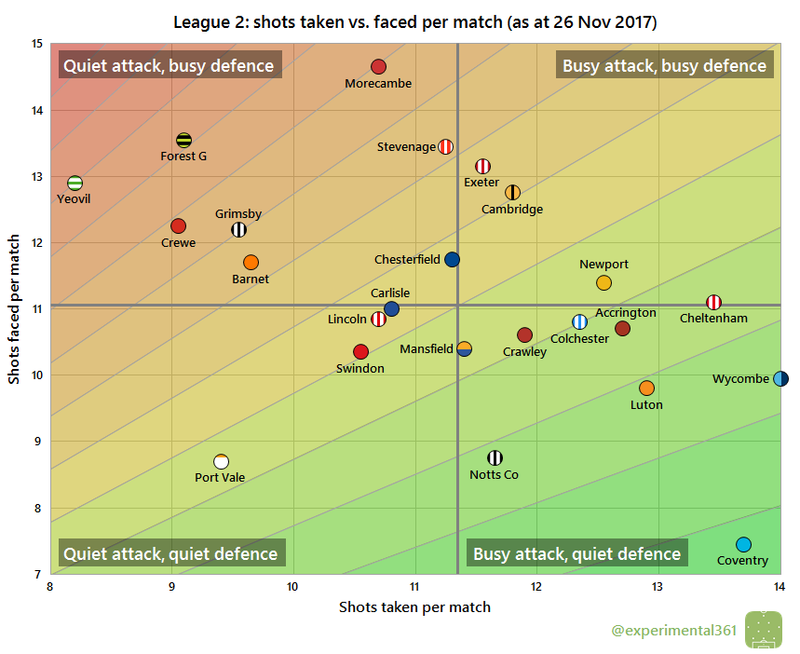 It’s not surprising to see free-scoring Luton in the bottom right: while they don’t create the most chances overall, they’re the division’s most clinical finishers. Interestingly Yeovil are compensating for carving out the fewest opportunities with a similar degree of ruthlessness in front of goal. Coventry meanwhile have struggled to make their chances count: only Cambridge, Crawley and Morecambe have been more wasteful, with all four standing out as being overdue a bit of luck up front. Coventry‘s defence has looked impressive from the beginning – they’ve allowed far fewer shots than anyone else and are the division’s most resilient at soaking up their opponents’ efforts. Exeter‘s stubborn defence has helped to sustain their promotion challenge so far and they’ve absorbed plenty of shots for each goal conceded. 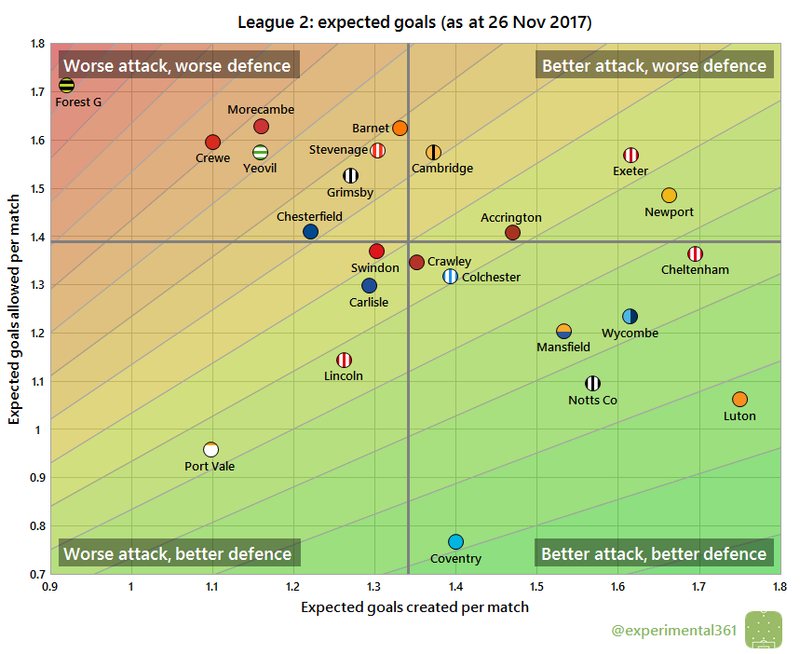 Cambridge and Morecambe may be struggling to convert chances (as per the previous graphic), but at least they’re making it almost as tough for their opponents to do likewise. Port Vale aren’t allowing many chances but the readiness with which they’re conceding is undermining their efforts – a similar problem to Liverpool this season, who sit in a similar position on the Premier League version of this graphic (which I’ll update soon). Wycombe are also having their promotion efforts sabotaged by a leaky back line. While Coventry have created plenty of chances (as per the first graphic), their attack looks a lot more average here when we correct for shot quality, suggesting that many of those efforts are struck from poor positions. Their defence is potentially awesome enough to compensate however. The reverse is true of Exeter and Newport, whose defences have looked vulnerable enough to cancel out a lot of the good work being done further forward, while Port Vale games don’t have much of note happening at either end of the pitch.